The Royal Air Force Museum and Jane Nightwork Productions presents a ‘World Premier’ theatre production of The Red Baron, written and directed by TV actor Robert Gillespie. He was never seen with a girl, though – or hardly ever. Hacked off with being pestered and nudged by his friends, he calls on Coco. She’s one of the girls in a house near the front. Where all the squadron goes. But all Manfred does is talk about planes and guns – and shooting down enemy flyers. For most of us, World War One means trench warfare. But in 1915, for the first time in history, young men were soaring the skies. Fighting in flimsy machines for country and personal glory. This play is about them. And one man’s astonishing change of mind. 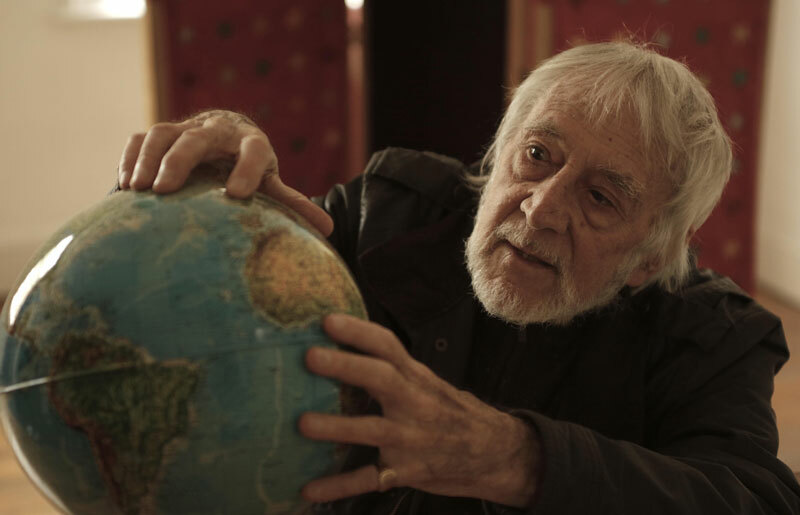 Robert Gillespie began his acting career with two years with the Old Vic Company, beginning in autumn 1953 for Michael Benthall’s Shakespeare seasons. In the company were Richard Burton, Clare Bloom, Fay Compton and Michael Hordern. The second year was headed by Paul Rogers, Ann Todd, Virginia McKenna and John Neville. His TV roles include Hugh and I Spy, The Good Life, Whatever Happened to the Likely Lads, Robin’s Nest, George and Mildred, Rising Damp, The Fall and Rise of Reginald Perrin, Porridge, Dad’s Army (in which he played Charles Boyer playing Napoleon Bonaparte), Butterflies, The Liver Birds, Beggar My Neighbour, Agony, Terry and June and It Ain’t Half Hot Mum. Royal Naval Air Station Yeovilton International Air Day 2016 takes to the skies on Saturday 2 July. Now fast approaching its seventieth anniversary (the first event was staged in 1947), Air Day is one of the Royal Navy’s premier annual events and among the South West’s key single-day shows, attracting up to 40,000 spectators. An action-packed day featuring five hours of spectacular flying displays, extensive ground displays and a galaxy of other attractions is in store for all who attend. Air Day 2016’s theme is Naval Aviation – Past, Present & Future. We will remember a landmark Royal Navy engagement of 75 years ago when Swordfish biplanes famously helped sink a key German Navy battleship. We say farewell to the maritime Lynx, paying tribute to the Fleet Air Arm’s outgoing small ships helicopter, which will be retired in March 2017, and looking to the future, we celebrate the new generation of Wildcat and Merlin helicopters. Navy Wings – A rich assortment of past naval aircraft including the Royal Navy Historic Flight’s Swordfish biplane torpedo bomber in its 820 NAS Bismarck attack scheme, the pounding Seafire and Corsair WW2 fighters, both in British Pacific Fleet schemes, and the world’s only flying Sea Vixen fleet air defence fighter of the 1960s. Ground exhibits include the Sea Fury – one of the fastest piston-engine fighters ever built, the mighty Phantom 1970s fleet air defence fighter and two Sea Harriers. International Display Teams – Three world-class international display teams, with Air Day newcomer the Polish Air Force’s Orlik Aerobatic Team joining longstanding crowd favourites the RAF Red Arrows and the Royal Jordanian Falcons. 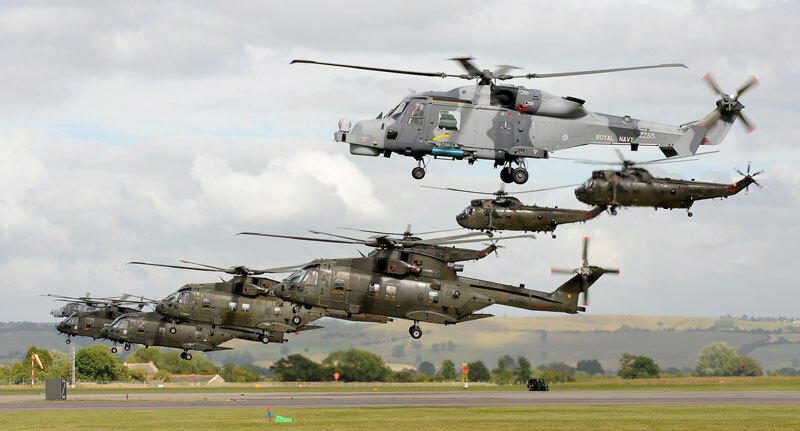 Lynx Farewell – One very last chance to see these legendary maritime helicopters in action over home ground at Air Day. Our Lynx Farewell events include a special formation flypast and a spectacular Maritime Role Demo. 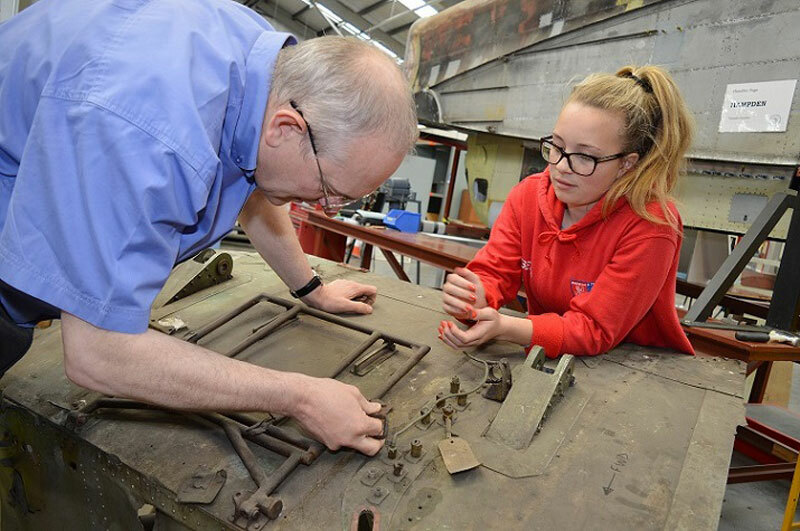 STEM – The Royal Aeronautical Society’s wind tunnel, the Imagineering Foundation’s interactive exhibits and other features making up our STEM (Science, Technology Engineering and Mathematics) fair designed to inspire the next generation of engineers. B-17G Flying Fortress ‘Sally B’ – Europe’s only flying example of the famed US WW2 bomber, making its first Air Day appearance in over 15 years. Commando Assault Finale – World-renowned, Air Day’s Commando Assault finale features helicopters, troops and pyrotechnics galore! This edition will be the first in which the Commando Helicopter’s Force’s very impressive new Merlin iHC3 troop transport helicopters take centre stage. Arena & Music Displays – Highlights include the hotly-contested HMS Heron Field Gun Competition and performances from The Band of Her Majesty’s Royal Marines in the arena. Whilst in Hangar 8 the Yeovilton Military Wives Choir and HMS Heron’s Volunteer Band will be on hand to entertain you. 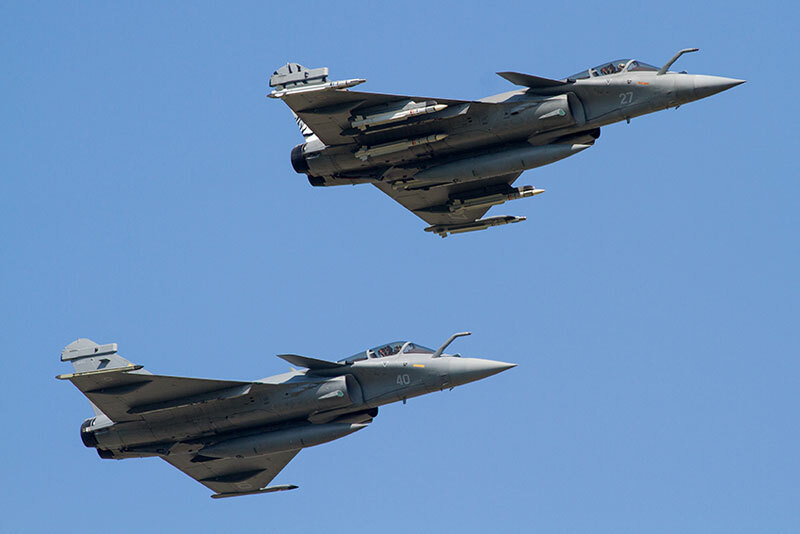 Roaring Fast Jets – Cutting-edge multirole fighters, with a sensational solo display from the RAF’s Typhoon FGR4 and the French Navy’s scintillating Rafale M role demonstration pair, again making its only UK airshow appearance of the year. The ‘Heavies’ – Dominating the static park will be a line-up of huge overseas military aircraft including an E-3A Sentry, C-17 Globemaster and C-160D Transall. Most of them will be opened up to the general public. Family Attractions – For car enthusiasts our extensive vehicle exhibition includes an array of ex-military vehicles, classic cars and high-performance supercars to view and even sit in. Meet Transformers, Star Wars and Superhero characters who will be roaming around the showground, interacting with our younger visitors. For the more adventurous there are simulators, pleasure flights and thrill-seeking fairground rides including a 90ft sky swing! Discounted Advance Tickets are now only available from participating Tourist Information Centres until 5pm Friday 1 July. Tickets are also available On the Day priced at £27 for Adults and £14 for Children under 16. Children under 5 are free of charge. Full details, including visitor information can be found at www.royalnavy.mod.uk/yeovilton-airday or by calling the Ticket Office on 0330 100 3656. Featuring the F-35B ‘Lightning’, two RAF Typhoons and the legendary aerobatics display team the Red Arrows, this uniquecombination, flying together, will provide one of the many highlights planned over the three-day event. The pairing of the F-35B and Typhoon, which together represent the fast jet component of the UK’sfuture air defence capability, comes as the F-35B performs its first ever display outside of the US. Air Tattoo spokesman Richard Arquati said: “Over the years the Air Tattoo has staged a number of memorable joint flypasts, many featuring the Red Arrows,most notablywith the US Air Force F-117A stealth fighter in 2003, the A380 in 2013 and with the iconic Vulcan XH558, on its final Air Tattoo appearance,in 2015. 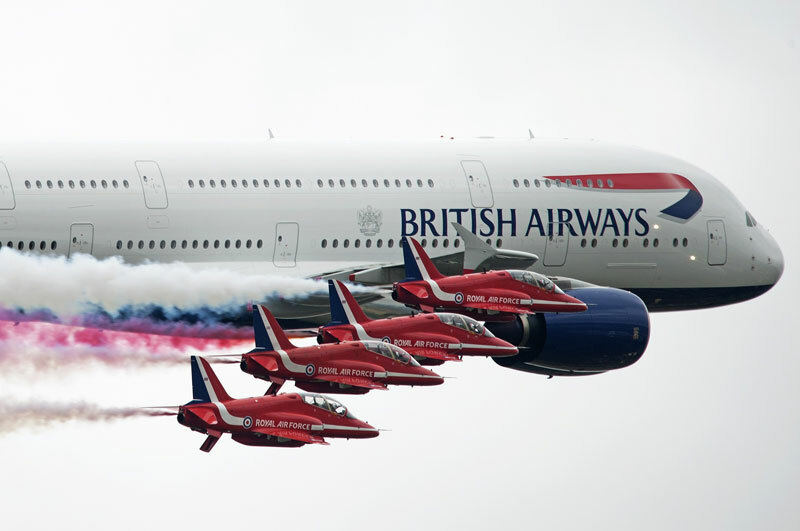 Buckle Up – Bournemouth Air Festival Is Coming Into Land! Details announced for the four day extravaganza of land, sea and air display entertainment at the UK’s leading seaside resort… it’s more than just an air show! 23rd June 2016: Back to impress the hundreds of thousands of avid fans who annually flock to the UK’s leading seaside resort, the skies of Bournemouth will hosting displays from the awesome RAF Red Arrows and the mighty Typhoon, SallyB and The Blades , to name but a few, supported with a multitude of land, sea and air Royal Navy assets, Pier-to-Pier county show trading stalls and Wave105 staging three nights of music, including a ‘proms on the beach’ style concert, the best chart acts and a celebration of dance music. The Red Arrows, supported by Morgan Sindall, will be performing at the festival and visitors can see the breath-taking team in action at the set time of 1545 (3.45pm) on all four days. Last seen in 2013, the Breitling Wingwalkers are returning with the ever-popular Tigers Parachute Team making daily jumps from an amazing 6,000feet freefalling at an incredible 120mph! Not forgetting the SallyB, Twister Duo and The Blades. In the skies will be fantastic dusk displays from the Red Devils and O’Briens Flying Circus starring Otto The Helicopter, as well as Team Fire Flies and Aerosparx, both bringing formation flying and pyrotechnics to the evening display programme. Thursday evening will be a very British affair with a ‘Musical Spectacular’ performed by the Band of Her Majesty’s Royal Marines Collingwood, Friday night is ‘Pop Night’, sponsored by Shorefield Holiday Parks and Saturday night ‘Sunset on the Beach’ is the official, not-to-be-missed, beach party with Halo. Tickets start from £10. 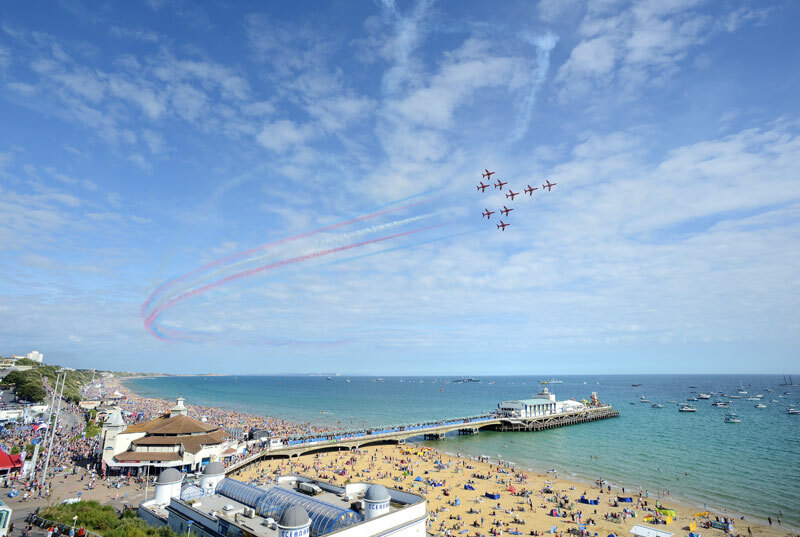 With day and night time entertainment on land, out at sea and in the air, displays from old favourites, a Bournemouth debut for some new faces as well as a great soon-to-be-announced Wave105 line up, the 2016 Air Festival is certainly set to be the event of the summer! Cockpit-Fest 2016 proved to be another great event at the Newark Air Museum site in eastern Nottinghamshire. We would like to add a special thank you to the Battle of Britain Memorial Flight for their excellent Spitfire and Hurricane flypasts. Could the line-up for Bray Air Display 2016 be any better? You won’t want to miss the 11th annual aerobatic extravaganza which has been extended to a two day, full weekend event this year on Saturday 23rd and Sunday 24th July. The full line-up of world-class aerobatic display teams including none-other than the Daddy of them all – the Red Arrows; Italy’s flamboyant Frecce Tricolori; the dare-devil Breitling Wingwalkers (yes they walk on the plane wings mid-air!) and our very own, celebrated Irish Air Corps has been revealed – firmly cementing #BrayAirDisplay, supported by main sponsors the Irish Aviation Authority, as one of Europe’s best ever air displays. Featuring 27 jets, 46 aircraft and pilots, 50 support crew and an army of 20 volunteers it will be an aerobatic feast for the senses! 11 acts will perform on Saturday 23rd July with a further 5 acts also performing on Sunday 24th July, bringing the total on Sunday to a whopping 16 high quality participating air display acts. The Frecce Tricolori: The Italian aerobatic display team and one of the most experienced and awe-inspiring display groups. This will be the first time that they will perform at the event and is a huge coup for the organisers. Breitling Wingwalkers: The world’s only formation wingwalking display team and another first for the Bray Air Display. ‘Wingwalkers’ will perform a dazzling sequence of acrobatic manoeuvres and handstands whilst strapped to the top wings of beautiful Boeing Stearman biplanes! Patrouille Tranchant: A Celtic jet team from Brittany, France flying Fouga aircraft – the first time Fouga aircraft will be displayed in Ireland. British Spitfire/Seafire: First time in Bray as a team. Spitfire is probably the best known fighter plane ever produced. The Ravens: A UK based formation aerobatic display team formed in May 2014. The Red Arrows: One of the world’s premier, most celebrated and best known aerobatic display teams – the centre piece of this summer’s display. This will be the first time that the Red Arrows will perform at the annual event and the team’s only performance in Ireland this year. The Viggen & Draaken: Representing the ‘Swedish Air Force Historic Flight’ flying ‘Viggen’ (first time to be displayed in Bray) and ‘Draken’ aircraft (first time to be displayed in Ireland). 90,000 people made their way to Bray Promenade for the display last year which has been established as one of the country’s most popular, free, family summer events. And with a line-up like the one confirmed for this year, even more spectators are expected to make their way to the Co. Wicklow seaside town this year to watch aviation antics against a backdrop of beautiful Bray head and the County Wicklow coastline. Those planning to attend are strongly advised to use public transport for a stress-free journey, allow extra time for the trip to Bray and plan to arrive early to fully enjoy the fantastic event. While the event is free for all to enjoy, VIP hospitality packages are available from Bray Air Display for those who prefer to enjoy the spectacle in style. Visit http://brayairdisplay.com/wp/hospitality/ for more information about the two packages available: Flight Deck €70 per person (plus booking fee) or Aviation Lounge €120 per person (plus booking fee). As well as the incredible display in the skies over Bray there will be a food and craft village featuring 45 artisan food and specialist craft stalls as well as musical entertainment and a family fun fair – all in all a great family day out. Or why not take to the skies to experience the thrill and exhilaration of a helicopter pleasure flight on either day between 11am and 12noon? “It is going to be an amazing show – a once in a lifetime really. You won’t want to miss it!” concluded Se. All events and activities are subject to change without notice and may be dependent on weather. RAF Cosford has been a hive of activity this week, as the military base prepares for its annual air show, one of the Midland’s most popular outdoor events. The Air Show team have also recently announced a number of exciting last minute additions to the flying programme, including the rare appearance of a United States Air Force strategic bomber, the Boeing B-52H, which will be performing a number of flypasts. Other aircraft recently confirmed also include a RAF Puma HC2 helicopter and RAF C-130J Hercules which will both be appearing at the show. 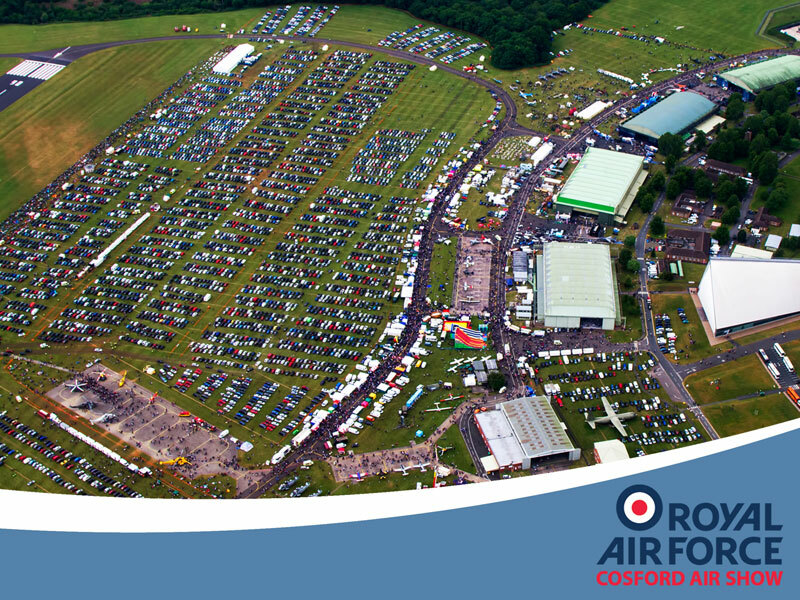 Organisers are also keen to remind people of the event’s advanced ticket only policy, meaning that those who do not have a pre-purchased ticket to the show should not attempt to travel to RAF Cosford on Sunday. Tickets are still available to purchase online at www.cosfordairshow.co.uk or from selected Mid Counties Co-Op stores, the RAF Museum at RAF Cosford and Hendon and the Midlands Air Museum in Coventry. Tickets cost £25.00 per adult with accompanied children under 16 entering free. Large transport aircraft from three different air arms will dominate the static display at RNAS Yeovilton Air Day 2016. 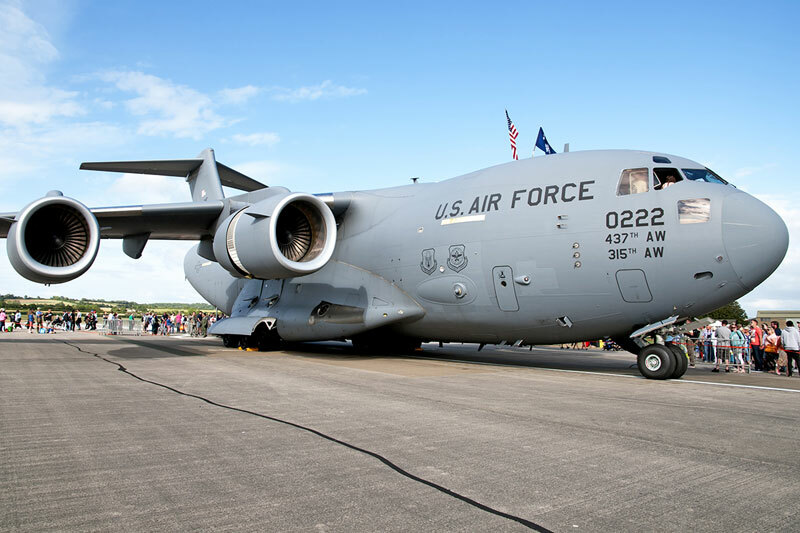 The United States Air Force’s vast C-17 Globemaster III, a German Air Force C-160D Transall and a Polish Air Force CASA C-295M, have all confirmed their attendance and will be open to the public to view. Among the biggest types in NATO’s inventory, the Boeing C-17 is a strategic airlifter able to fit some 100 paratroopers inside its cargo hold. Air Day’s example hails from the USAF’s 315th Airlift Wing based in South Carolina. The Globemaster was opened up for public inspection at last year’s show – a move that proved incredibly popular. 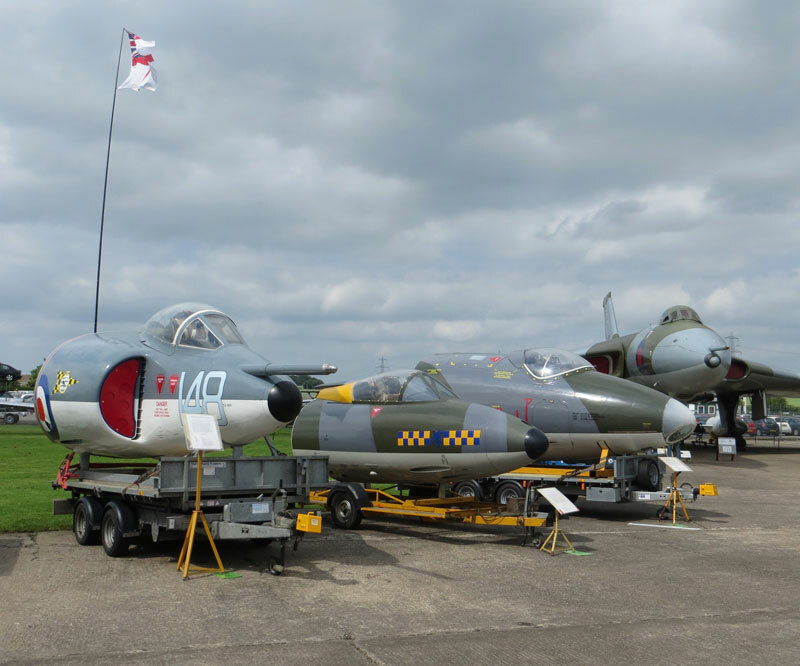 The aircraft deservedly won Air Day 2015’s best static display award and the aircrew were full of praise for the enthusiasm shown by Air Day visitors. Consequently, they made it their mission to return to Air Day this year. The German Air Force’s C-160D Transall tactical transport aircraft are now nearing their career’s end, making UK airshow appearances from them an increasingly rare prospect. An example will be on static display alongside a German Air Force Tornado IDS swing-wing strike aircraft. The CASA C-295M represents a more modern breed of transporter and Poland, operating 16 examples, has more C-295Ms in service than any other European nation. The one attending Air Day is the support aircraft for the Polish Air Force’s outstanding Orlik Aerobatic Team which is making its show debut.